Chris and I have eaten our share of meatballs, and few compare to these for consistent taste and quality results. What we've found is that there are so many ways to make them. And, other nationalities make them too! They just call them by a different name and have a different taste due to culture. The associated image is how Louise cooked them and we have followed in that tradition. After they are seared they are placed in our favorite tomato sauce. So when you prepare and eat Louise's tasty delights, be prepared to make them over and over again. Once they are prepared and cooked, you can freeze them with no sauce and add your own when you want to eat. And, they go great with onions and peppers as well as tomato sauce and even brown gravy. Try these on for size. You won't be dissappointed! (Bread crumbs are best when hand broken into pieces). Put ground sirloin and all other ingredients into large bowl and mix by hand until all is blended throughly. Refrigerate mix for a couple hours before frying. In a Presto 06626 11 inch Electric Skillet w/glass lid, cover bottom with Olive oil and heat on medium. While oil is heating, take small amounts of the meat mixture and form small to medium size balls by rolling each piece between palms of hands making a rolling motion. As each ball is made, gently put it into the frying pan and lightly brown the circumference of it. As they turn brown take them out of the oil and gently place them in a sauce pan filled half way with tomato sauce on low heat (see sauce recipe). Let simmer for 2 - 3 hours. The sauce will bubble the longer you let them cook. Keep a watchful eye on them and after each 30 minutes, gently stir without breaking them so they may get even heat. Taste test after 2 hours by breaking one to see if the inside is no longer pink, then consume. You may serve these immediately or you may freeze them for future use. Note: Refrigerating meatballs prior to frying helps to enhance flavor and keep their shape. Low Fat Substitute If you can find Bell & Evans ground Turkey, subsitute it for the sirloin. Slightly different taste without your favorite sauce, but none-the-less a great tasting meatball. I know, these are just that, but everyone likes Italian and Gram's meat-balls are always a favorite. In our travels, we came across some ingredients that have enhanced Gram's and since I am a person of gastronomical adventure decided to kick them up a notch. It is not easy being the Guinea pig because sometimes your taste-buds just go dark, but none-the-less, I think these made a big hit (all but six were gone). he making of them is quite simple, but add too much of one ingredient and you could have a disaster. No! You don't need a fancy kitchen and you don't have to be a trained chef to whip these up, and if you have a large family, this recipe serves six with no problem. Don't have a large family? Make the quantity anyway and put any remaining in the freezer after cooking them thoroughly. In a large mixing bowl, place ground sirloin and break apart into small pinky size pieces. Add the chile power, dry mustard, garlic powder and sweet basil mixing thoroughly. Add the bread crumbs half at a time and mix well so that all the bread crumbs are evenly mixed. Add the minced garlic and mix well again. Add the eggs mixing until all the ground sirloin has a slick look to it then let stand for about 5 minutes. Take a small amount of the mixture and form a ball about the size of a golf ball rolling until the mixture stays together. The size of the ball will dictate how many meatballs you will get. In this recipe, 24 meatballs were all that was needed so they were a bit larger than a golf ball. Place each ball on a platter until all the meat is rolled. While rolling the mixture, add the olive oil and heat in an electric skillet to 325 degrees. Once the oil is hot, add enough balls and brown the surface of each. Add only enough so that they can be turned and cooked on the entire surface. This insures all the sirloin is cooked through. If you don't have to have an electric skillet, to cook the meatballs, you can use a frying pan on the stove. I recommend a Presto 06626 11 inch Electric Skillet w/glass lid because the oil will not overheat reducing the chance of you getting burned. Cook so that the surface of each meat-ball is brown and a bit crisp. 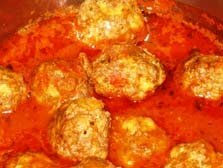 Place each meat-ball on a platter with a paper towel to drain any excess oil. Add your favorite tomato sauce to a 2 quart sauce pan. Place the browned meatballs into the sauce and stir carefully so that each meatball is covered with sauce. Place a cover on the sauce pan and simmer for about 2 hours or until the center is cooked if not already done from the skillet. These will melt in your mouth. Serve Hot or cold. Best flavor when hot. Add more chile powder if you want them to really kick when going down. Serve them with Italian bread and thinly sliced provolone with a garnish of Mozzarella and extra sauce. Use plain or Italian Panko bread crumbs unless you have access to our secret ingredient's location. Secret Ingredient – Chris and I grew up in and around the Hartford, CT area. In Hartford there is an Italian family restaurant on Maple Avenue. Need we say more? We have not been able to reverse engineer the bread crumbs, but have come close. If you are in the Hartford, CT area seek out Maple Giant Grinder, have one of their signature chicken cutlet or beef cutlet sandwiches with a garnish of cooked peppers, provolone and a little extra sauce. You won't be disappointed... messy but not disappointed! Return to Easy Everyday Cooking Recipes from Meatballs.